I don’t think I’ll ever stray from libertarianism. But if I ever get tempted by the siren song of statism, I’ll bolster my resistance by reminding myself of how people have been victimized by venal government. And if that doesn’t get my libertarian blood boiling, I’ll revisit some of my columns on so-called civil asset forfeiture. This is the policy that allows the government to steal your money. I’m not joking. Bureaucrats can take your money (or property) simply by concocting a claim that it may have been associated with criminal activity. They can grab your cash even though you haven’t been convicted. Heck, they don’t even need to arrest you. Let’s look at some new examples of this odious practice. We’ll start with this video clip from a local news station in Sacramento, California. And here’s another example from West Virginia, as reported by the Charleston Gazette-Mail. Efforts to curtail this disgusting tactic have not been successful in West Virginia. In February, the state House Judiciary Committee considered a bill that would tie civil asset forfeiture to its respective criminal proceeding, i.e., if you’re acquitted criminally, the seized property cannot be forfeited. The bill died in committee. But this story does have a happy ending. When this example of theft-by-government began to get publicity, the bureaucrats decided to return everything they stole. After the Gazette-Mail reached out to the state police Monday with inquiries about the seizure, and after weeks of Smith calling police, the Jefferson County prosecuting attorney and local politicians, Smith said an officer returned her and Patlias’ possessions in full Thursday evening. Speaking of good news, some governments around the country are curtailing this venal practice. And the Utah Supreme Court also is taking a jaundiced look at civil asset forfeiture, even if only for procedural reasons. The Utah Supreme Court has sided with a man pulled over in a traffic stop where police seized more than $500,000. In a unanimous ruling published Wednesday, the state’s top court ordered a lower court to reconsider who has jurisdiction over the money seized when Kyle Savely was stopped in a 2016 traffic stop. A drug dog alerted to the presence of narcotics, but none were found. Instead, a Utah Highway Patrol trooper found cash and seized it despite never charging Savely with any drug crime. …The libertarian-leaning think tank Libertas Institute, which jumped into the case, praised the ruling. They argued that state and federal agencies often split seized money. “The public is rightly outraged by laws that allow the government to take property from people not charged with a crime, as was the case here. It’s even worse when state laws designed to protect a property owner’s rights are not followed by state agencies, which is why we’re very pleased to see the state’s highest court unanimously holding them accountable,” Libertas Institute President Connor Boyack said in a statement. What we really need, though, is for the Supreme Court to decide whether governments have the right to steal. And that’s exactly what may soon happen, according to Jibran Khan of National Review. Did you know that, in most states, the police can take your money and property without even charging you with a crime? Mundane actions such as having cash on hand have been cited as grounds for seizure, as a young man moving to Los Angeles to start a business discovered when his life savings were seized. He wasn’t detained, or charged with any crime — but he was left with nothing when the Drug Enforcement Agency took his cash. In any other situation, we would label this theft… Stories abound of abusive seizures justified under civil forfeiture. …A new Supreme Court case, however, might change that. …Justice Thomas has hoped for a civil-forfeiture case to come before the Supreme Court, so that this practice, which he views as incompatible with the due-process clause, can be analyzed on constitutional grounds. When it considers Timbs v. Indiana later this year, the Court will be able to do just that. Kudos to Clarence Thomas for wanting to protect our rights. If you need more evidence, Khan goes on the summarize why civil asset forfeiture is so reprehensible. The system incentivizes policing for profit, rather than for public safety. The way that seized money is spent is just as disgraceful as the takings themselves. Departments have used forfeiture funds to buy Mercedes-Benzes, BMWs, Corvettes, Hawaiian vacations, and ski trips — just to list a few. They have also used these funds to buy military equipment, which has contributed to the dissolution of Sir Robert Peel’s concept of good policing that held the police should be well-integrated with the public rather than seeing itself as a military force. 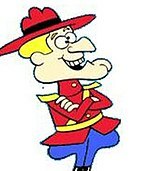 It’s no surprise that Brad Cates, who headed up asset forfeiture at the Department of Justice in the 1980s, describes it as “a free-floating slush fund.” The taking of property from citizens who are not charged with crimes to fund lavish lifestyles for government officials sounds like something out of the most dysfunctional Third World regimes. It’s heartening to see that the Supreme Court will hear the case. The practice is an affront to both constitutional and cultural norms, and has empowered law enforcement to engage in what would be considered criminality by any other measure. By the way, Brad Cates is one of two former officials who were in charge of asset forfeiture who now reject the procedure. Sadly, this is an issue where Trump and his team are definitely on the wrong side. P.S. 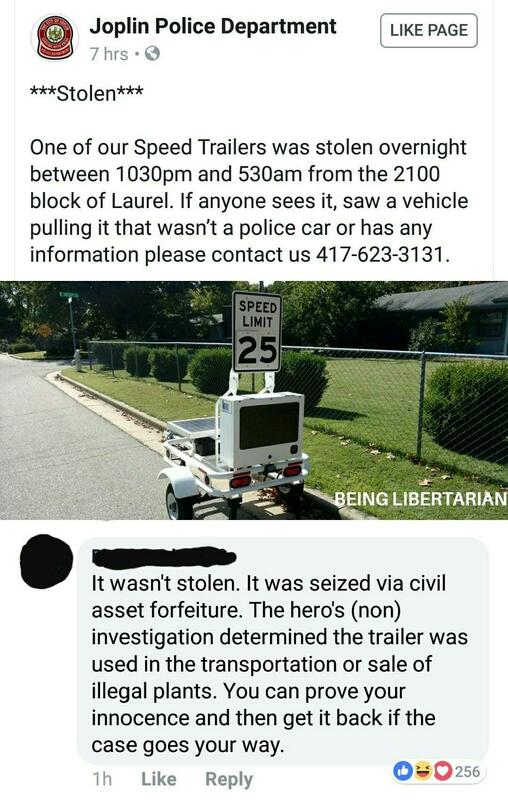 Defenders of civil asset forfeiture sometimes tell me that I shouldn’t get upset because many of the people who lose their property are criminals. I’m willing to acknowledge that some of these folks may not be model citizens, but I make two basic points. Our Constitution has a presumption of innocence, so people shouldn’t be punished unless found guilty by a jury of their peers. In other words, I side with the Founding Fathers rather than Jeff Sessions. Something shouldn’t be against the law if there isn’t a victim. 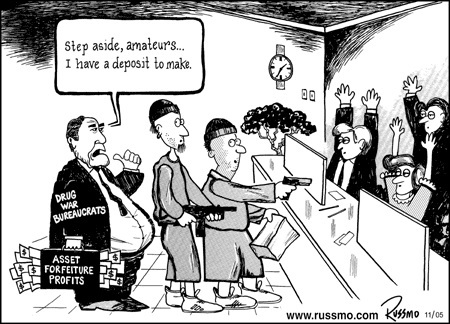 This is why asset forfeiture laws, just like drug laws and money-laundering laws, are misguided and should be repealed. It’s a judgement call, of course, but I think the IRS’s suppression of the Tea Party was the worst of all the Obama-era scandals. Some people say the green-energy scams like Solyndra should be at the top of the list, but steering taxpayer money to campaign donors was just routine corruption. And the fast-and-furious scandal at the BATF was reprehensible, but did not have systemic impact on society. Lois Lerner and the other hacks at the IRS, however, did something profoundly worse. They actively used the coercive power of government to suppress political speech. The bad news is that Lois Lerner didn’t get punished. She’s now enjoying a fat taxpayer-financed pension. And other IRS officials successfully stonewalled with no adverse consequences. 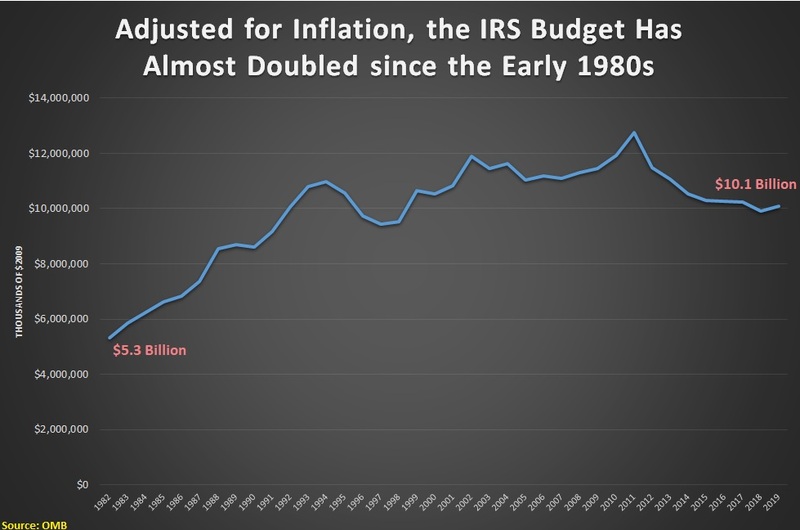 Heck, Republicans actually rewarded the IRS with a bigger budget. And the Trump Administration so far has been AWOL on curtailing IRS abuses. But that may be about to change. One of the President’s appointees has expressed support for protecting donors to nonprofit organizations. ….a Congressional hearing this week offered potentially good news to nonprofits whose donors are under political threat. …Montana Republican Steve Daines asked Acting IRS Commissioner David Kautter whether the agency is considering the necessity of IRS 990 Schedule B. These are the forms that nonprofits must supply to the IRS listing donors who contribute more than $5,000. Schedule Bs are supposed to remain confidential, but AGs in New York and California have sought to require nonprofits to file them at the state level. Many Democrats see the form as a gift-wrapped list of donors to target, and a way to chill donations to conservative nonprofits. …Mr. Kautter acknowledged that he was “actively involved” along with Treasury Secretary Steve Mnuchin at offering more donor protection. …Nonprofits would still be required to keep their donor details, and if the IRS or other authorities had valid reason to suspect fraud they could demand to see the records. But requiring nonprofits to provide names each year to partisan AGs or tax bureaucrats is an invitation to repeat the scandal of the Obama years when Lois Lerner and the IRS targeted conservative nonprofits. Brian Garst of the Center for Freedom and Prosperity also weighed in on the issue, pointing out that government has a sorry track record of persecuting political dissent. …robust protections for speech were listed first among the Bill of Rights and have long been a cornerstone of our republic. …Like the secret ballot, respecting donor privacy and thus anonymous speech and association is essential to prevent majoritarian abuse and intimidation that subverts democracy. This was a lesson learned in the civil rights era after the shameful attacks on the NAACP and its supporters. …Lois Lerner was found to have illegally shared confidential Form 990 taxpayer information with the Federal Election Commission. The solution is to not let the government get the information in the first place, especially since it isn’t needed to enforce any tax laws. Unfortunately, invasive donor reporting requirements instituted by the Internal Revenue Service threaten to chill this critical democratic tool. …Schedule B requires 501(c) organizations to include certain contributors’ names and addresses with their annual Form 990 reports. Yet the IRS has acknowledged that this information has no enforcement value. Instead, its collection creates opportunities for abuse and chills speech and civic participation. …there’s good reason to question the ability of the government to protect sensitive taxpayer information given the history of inadvertent disclosures and information leaks at the IRS. …For minority viewpoints, public exposure can lead to intimidation… Several years ago, the IRS was said to be considering dropping the unnecessary Schedule B reporting requirement, which it was never required by statute to collect in the first place. Unfortunately, the agency did not follow through under President Barack Obama… The Trump administration should do what the Obama administration would not and ensure the right of Americans to participate in the political process without fear that they will be made vulnerable to targeting based on their political views. Though I think both Brian and the WSJ should have gone even farther and called for the abolition of the charitable deduction in the tax code as part of a shift to a simple and fair flat tax. Then there would be zero rationale for the government to know about our donations. And since there’s plenty of evidence that nonprofits would prosper without a special preference in the tax code, this would be a win-win reform. P.S. Privacy is an under-appreciated benefit of fundamental tax reform. Not only would donors and nonprofits no longer have to share information with the IRS under a flat tax, we also wouldn’t need to tell the government anything about our homes since the mortgage interest deduction would vanish. And since the death tax and capital gains tax are abolished, the government would have no need to know about our assets. And since all capital income is taxed at the business level, we wouldn’t have to tell the government about any stocks, bonds, or bank accounts we own.